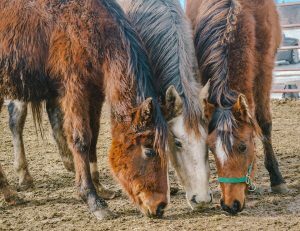 Largest Horse Rescue Operation in the U.S.
It’s been a big month for the ISPMB mustangs! In March they were hauled back to Minnesota to one of our main foster facilities (Thank you to Hay Chix for doing the hauling!). They all learned about being in stalls and that it is okay to be separated from each other. Pablo, Emila, Francisco and Enrico were all pretty far along in allowing themselves to be caught and learning how to lead (thank you to Karen Murray). Monte and Padre were still pretty skeptical but eventually they allowed us to catch and halter them. 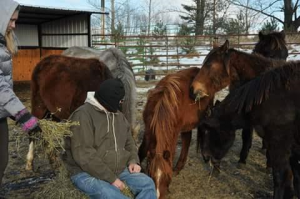 We were able to convince Dr. Nicole Eller to take a day out of her busy schedule and geld the 4 older boys (by the end of April Dr. Nicole will have gelded around 150 mustang stallions from the ISPMB case!) We have determined that Monte and Padre are both 3-4 years old, Enrico, Francisco, and Emilia are 2-3 years old, and Pablo is actually 5 years old! Upon examination Pablo did not have testicles present–so we sent blood serum into UC Davis for a testosterone check. Sure enough it came back positive–so he needs to have cryptorchid surgery (castration surgery for undescended testicles). We will be scheduling that asap. 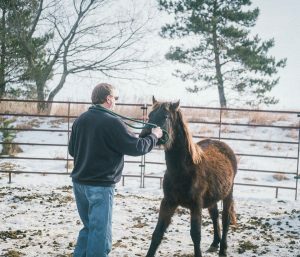 Pablo is pony-sized–so that is making us wonder if he was maybe dumped off at ISPMB because his owner didn’t want to pay to have the surgery. 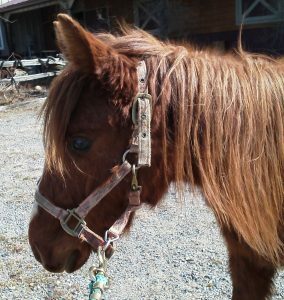 He may not be a mustang after all… Now that Monte and Padre are also halter broke it was time to schedule farrier work for everyone. Thank you to Joe Yanish for coming out to do the trimming! 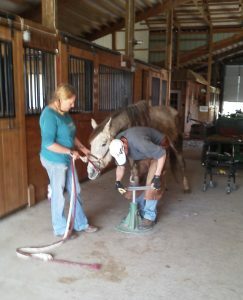 Because several of these guys still have some pretty big trust issues when it comes to things like the vet and the farrier, we opted to use light sedation to do the trimming. This ensures a much more positive experience for them the first time. This week (second week in April) will have one more big adventure in store: 2 or 3 of them are going to be picked up by their Promise of the Future trainers! 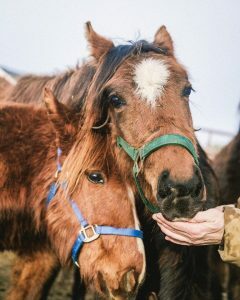 We know they are going to be nervous about being separated and it may be an adventure getting them on the trailers–but we do think they are all going to thrive with the one-on-one attention they are going to receive. We have been impresses with how smart, curious and friendly they all are! 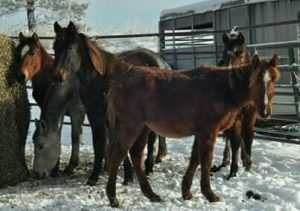 All six of the mustang yearlings are doing well in their foster home. Several have had halters on and have had some lessons in leading. Emilia and Padre are still a little resistant to human contact. Pablo, the youngest of the group, is coming along the farthest–he even had his hooves trimmed for the first time! (You can find individual information on each of the mustangs here: Padre, Monte Pablo, Francisco, Enrico, and Emilia). 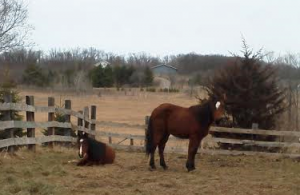 The colts will all be gelded once they are halter broke. If you would like more info on any of these yearlings, please Contact Us. 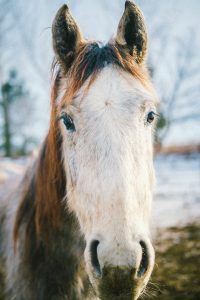 We could also use donations of high-quality alfalfa/grass mix hay in small square bales (preferably delivered to Dresser, WI) to assist in hand-feeding to gain trust (don’t need to be large loads–even 15-20 bales would help!) 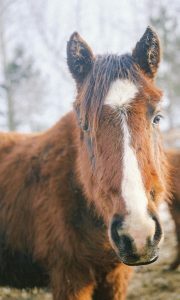 Donations of hay are tax deductible, as are monetary donations. Visit our Donate Page here for monetary donations! Thank you! (Photo credit: Courtney Stutelberg). 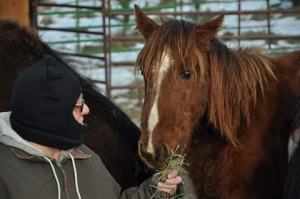 You can find more information on the ISPMB case, updates on the remaining horses, and information on how to help on the Fleet of Angels website and the Wild Horse and Burro Sanctuary Alliance website. 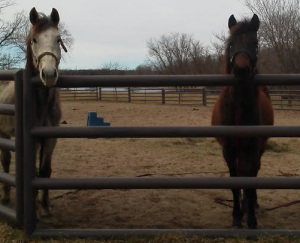 We want to thank our foster provider Karen Murray for giving them a safe place to stay and go through their quarantine period. Karen and friends will be working to get these youngsters used to handling and ready to move on to new adoptive or foster placements. 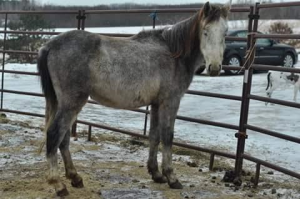 We want to thank Guardian Oaks Farm for providing transport when loading and hauling conditions in South Dakota couldn’t have been any worse! 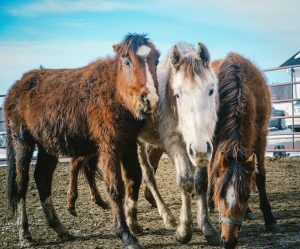 And we also want to thank the amazing crew of people working to sort and load all of these horses out in Lantry, SD, and Elaine Nash and Barbara Rasmussen for taking on the nearly impossible job of coordinating this mission. Thank you to Dr. Howard for opening his clinic on a Sunday so we could get coggins and health certs! 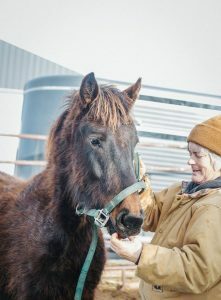 And also a big thank you to Jackie Fehn for helping so generously with the cost of hauling and for donating hay, and Patti Franz for hay delivery! There are 5 colts (Padre, Monte Pablo, Francisco, Enrico) and one filly (Emilia). 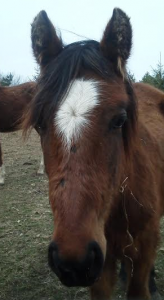 The colts will all be gelded once they are halter broke and will then be available for adoption (but if you are interested, please feel free to contact us now!) Emilia has an issue with one of her hind legs and will remain in rehab until we get a full assessment of what is going on. If you would like more info on any of these yearlings, please Contact Us. Karen and her friends Scott and Piper report that they are all getting more used to human contact, even allowing scratches and eating out of their hands. Thank you to Karen, Scott, and Piper for braving the cold to spend much needed time with these youngsters! 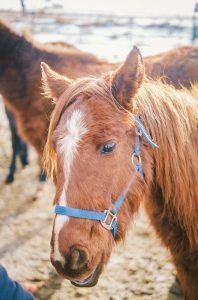 We could also use donations of high-quality alfalfa/grass mix hay in small square bales (preferably delivered to Dresser, WI) to assist in hand-feeding to gain trust (don’t need to be large loads–even 15-20 bales would help!) 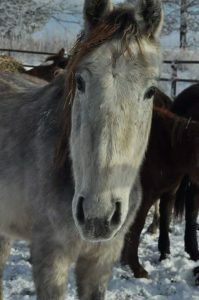 Donations of hay are tax deductible, as are monetary donations. Visit our Donate Page here for monetary donations! Thank you! (Photo credit: Laura Thai).